Lumos Helmet is a smart, beautifully designed bicycle helmet that features lights, brake and turn signals built into the product itself. 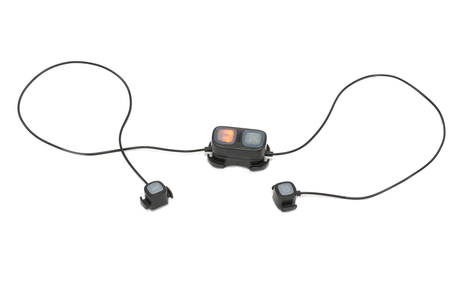 The three main innovation elements include: 1) Brake lights which automatically activate when you apply the brakes on your bike 2) Turn signals which are operated by a remote switch on the handlebars of the bike and function similar to turn signals on a car. 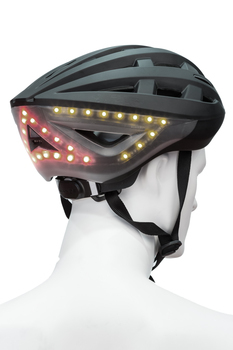 Once activated, bright yellow lights on the back and front of the helmet will indicate your intended direction. 3) Front and backward facing lights: Bright white lights are arranged in a distinctive pattern on the front of the helmet and bright red lights form a triangle at the back of the helmet. Dieser stylishe und gleichzeitig günstige Helm ist ein sinnvoller Beitrag zur Fahrradsicherheit. 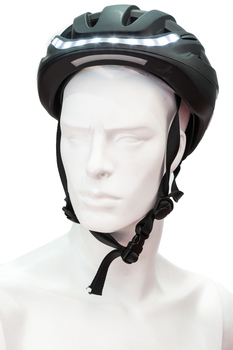 Durch die hohe Position ist der Fahrradhelm aus unserer Sicht die ideale Platzierung für passive Sicherheitselemente wie Beleuchtung.